My thanks to Professor Bill Sherman, Director of the Warburg Institute and Head of Research at the Victoria and Albert Museum, for permission to re-print his transcription of Panofsky’s answers. G. Stuart Smith, A Life in Code: Pioneer Cryptanalyst Elizebeth Smith Friedman (2017). see e.g. p.220. In what follows, my own commentary and its documentation is behind the black arrows. The post altogether is very long: more than 6,000 words if you expand it fully. But you can bypass the comments which make more than half of it, or come back some other time when you think they might be useful. The posts are published as notes and framework for the Bibliography. What I have not fully described in this post is the early, keen interest felt by both Erwin Panofsky and Richard Salomon, Panofsky having been offered (in 1933) a complete photostat copy of the ms, taking it to Germany where he consulted gave it to Saloman. The latter showed keen interest in the puzzle and later came with Panofsky to talk with met Anne Nill at the Library of Congress (where Nill worked). I think it telling that Panofsky declines to speak of his own opinion in answering Friedman’s quiz. Q 1: Have you examined the VMS itself. A: I saw the Voynich manuscript in 1931. Panofsky doesn’t say that he was presented with a full photostat copy in 1933, lent it to colleagues (including Salomon) but had it returned to him at some time before 1953. I’ll come back to that in another post. Q 2: What is it written on; with what writing tool? Note: *the term ‘calfskin’ is sometimes seen used instead of vellum, but this can cause confusion given that ‘calfskin’ is often used, by itself, to mean calfskin leather. If using ‘vellum’ there is no need to add ‘calf-skin’ in front of it; vellum is made of calves’ skins by default. Uterine vellum is different again. Q 3: What’s the date? A: Were it not for the sunflower which, if correctly identified, would date the manuscript after 1492, I should have thought that it was executed a little earlier, say, about 1470. However, since the style of the drawings is fairly provincial, a somewhat later date, even the first years of the sixteenth century, would not seem[sic!] to be excluded. I should not go lower than ca. 1510-1520 because no influence of the Italian Renaissance style is evident. It is a delightful moment of Panofsky wit – but since none of the cryptanalysts ‘got’ it and d’Imperio takes this answer at face value, as did Tiltman in 1968 and as current Voynich writers still do, I’ll spell out Panofsky’s ‘dig’ briefly here, having already discussed the “sunflower in the Vms” issue in a separate Page. So Panofsky’s pulling Friedman’s leg, knowing perfectly well that Friedman won’t realise it. There’s no other way to reconcile the answers given to questions 3 and 8 save a tongue-in-cheek logic which implies that for a manuscript to be ‘no later than the first years of the sixteenth century’ AND to show the ‘Peruvian chrysanthemum’ the draughtsman would have to be in Peru. … Dodoens wasn’t born until 1517. Hugh O’Neill, ‘Botanical Observations on the Voynich MS.’, Speculum, Vol. 19, No. 1 (Jan., 1944). Charles B. Heiser, Jr., ‘The Sunflower among the North American Indians’, Proceedings of the American Philosophical Society, Vol. 95, No. 4 (Aug. 17, 1951), pp. 432-448. Charles B. Heiser, Jnr., ‘Origin and Development of the Cultivated Sunflower’, The American Biology Teacher, Vol. 17, No. 5 (May, 1955), pp. 161-167. Q 4: Why do you think so? A: The above date is based on the character of the script, the style of drawing and on such costumes as are in evidence on certain pages, for example folio 72 recto. Panofsky indicates the criteria for dating content in a manuscript, but says nothing specific. Without further explanations given – or asked – the answer is one that would apply equally to whatever dates a person offered for any manuscript….We need to know how the ‘character of the script’ is perceived to accord with posited dates and, as importantly, with those of the place to which the item is being ascribed. The ‘style of drawing’, similarly… And just which dates (1470 or 1520 here, or fourteenth century as offered in 1931 1932) does he really think confirmed by the costume? He says the manuscript displays nothing of Italian Renaissance character. The majority of more recent writers, however, who have shared with us their perception of the figures’ costumes argue that they are High [and thus Italian] Renaissance. To be clear, it is a position which the present writer does not share. However, most recent writers have also focused to a surprising degree, almost obsessive, on the calendar’s ‘Archer’ emblem where Panofsky draws attention instead to f.72r, Once again, it seems to me, Panofsky is making an oblique joke at Friedman’s expense though – I sense – also offering a genuine bit of information even if only for the specialist in philology and comparative palaeography. (detail) f.72r Yale, Beinecke MS 408. Q 5: What’s it about? A: So far as can be made out before the manuscript has been decoded, its content would comprise: first, a general cosmological philosophy explaining the medical properties of terrestrial objects, particularly plants, by celestial influences transmitted by astral radiation and those “spirits” which were frequently believed to transmit the occult powers of the stars to the earth; second, a kind of herbal describing the individual plants used for medical and, conceivably, magical purposes; third, a description of such compounds as may be produced by combining individual plants in various ways . ‘Before the manuscript has been decoded’ is a slightly mocking comment; Panofsky’s life was spent ‘decoding’ pictures, for many of which no accompanying text was present. The error of supposing imagery’s understanding depends on accompanying text is another of those nonsensical ideas endemic in Voynich studies, and will be asserted by persons who, not knowing a word of Latin, still hunt manuscripts for images which they expect to find legible… and, of course, do find legible in a way they never find imagery from the Vms legible. The lesson which should be taken from this is that (a) when imagery derives from a familiar culture, it is legible and (b) when it is not legible it’s not because some accompanying text can’t be read. The fact is that Friedman did presume all about the manuscript was dependent on the text’s translation, and in 2008, when the present writer first came to the study and began explaining the imagery in terms of cultural and stylistic expression, she was informed that all comments on the imagery were “personal and subjective” or “theoretical” and that nothing certain could be said until the written part of the text had been read. As to Panofsky’s speaking of “general cosmological philosophy…” etc. – he has made a fairly obvious collation, heaping together bits from Newbold’s paper of 1921, and standard medieval ideas, but then ‘occulting’ them by means of what I’d describe as a purple-prose code. With delicious wit, he plays on ideas and terms proper to cryptography, while referencing medieval ideas and Newbold’s neo-Platonic speculations in a way you might well describe as contrapuntal. Panofsky is verbose; he uses substitutions (e.g. “astral radiation” for al_Kindi’s radii stellarum; “spirits” for angels)… and so on. This is typical of his multi-faceted commentaries on art and his well-known humour. So now, bearing in mind that the figure from f.72r is likely to be ‘read’ by any European as bearing a magic wand, and that the Americans called ‘Magic’ the system of coded messages generated by the Japanese ‘purple’ machine – and Friedman’s involvement in breaking that cipher, so Panofsky writes, verbose, with substitutions, Magic-Purple (prose).. about the rotas of heaven and earth… combining individual ‘elements’ in various ways.. In short, envisaging a cosmic, yet elegant, ‘enigma’. Quite beautiful! It wasn’t entirely nice of Panofsky, I suppose, to make sport of Friedman in that way, but it is a just parallel for the ‘sport’ which Friedman and his wife had made of Newbold. Nor had Friedman quite broken ‘Purple’ before It had broken him. His mind had given way in the first year of the war (1939) and while he was institutionalised, others in his team continued the work, with Lt.Francis A. Raven completing it. Mowry, D. P., “Cryptologic Almanac 50th Anniversary Series – Francis A. Raven.” NSA/Center for Cryptologic History, released Jun 12, 2009, FOIA Case# 52567. Friedman again broke down while trying to ‘break’ the Voynich text, and again had to leave the effort to others including Tiltman and Currier. In the end, the Voynich text defeated all who tried to ‘break it’, but those who – like Currier, Tiltman and others – were content to make careful observations of script and text-distributions etc. did make a lasting contribution. The Story of Magic: Memoirs of an American Cryptologic Pioneer, by Frank B. Rowlett (1998). a Friedman Bibliography from Muskingum University website: ‘The Literature of Intelligence: A Bibliography of Materials,with Essays, Reviews, and Comments by J. Ransom Clark. To see how Panofsky’s response to Q.5 reprised Newbold’s ideas is easy enough; the resources are online. As God gave their power to stones and to herbs and to words, so also he gave power to the stars, that they have power over all things, except over one thing. They have power over trees and over vines, over leaves and grasses, over vegetables and herbs, over grains and all such things; over the birds in the air, over the animals in the forests, and over the fishes in the waters and over the worms in the earth: over all such things that are under heaven, over them our Lord gave power to the stars, except over one thing. … man’s free will: over that no man has any authority save thyself. Berthold of Regensberg. Cited from Tester, A History of Western Astrology (1987) p.178. edit Feb, 26th., 2019 – apologies to Tester; it was I who had omitted the speaker’s name from my own notes. Q 6: Are there any plain text books sort of [sic.] like the VMS? A: Manuscripts in plain language remotely comparable to the Voynich manuscript are, unfortunately, of at least four kinds: first, herbals; second, cosmological and astrological treatises; third, medical treatises in the narrower sense of the term; fourth, possibly treatises on alchemy. As for the first kind, you seem to have more knowledge than I can claim. As for the second, I should advise to consult Sir Charles Singer, From Magic to Science, London 1928, and various publications by the same author; furthermore, it may be useful to consult Richard Salomon, Opicinus de Canistris, London, 1936; and F. Boll and G. von Bezold, Sternglaube und Sterndeutung, Second Edition (F. Gundel, Ed. ), Berlin and Leipzig, 1926. As for the third kind, ample material is found in two serial publications, both edited by the late Carl Sudoff: Archiv für Geschichte der Medizin and Studien zur Geschichte der Medizin; of alchemy I know very little and can only refer you to the Entstehung und Ausbreitung der Alchemie by E.O. von Lippmann, Berlin, 1919 ff., as well as a fairly recent book by the famous psychologist C.O. Jung. Don’t overlook the first conditional: ‘remotely comparable’. Again, Panofsky merely behaves as a Professor might towards a first-year student whose ‘theories’ outrun his basic knowledge. Panofsky here declines to discuss a single image from the Vms, or a single manuscript as ‘comparison’ for it, nor for a single detail in any drawing. As before, the basic message is, ‘Go away and read’. So in this answer – as I interpret it, anyway – Panofsky has no intention of doing more than pointing Friedman towards basic texts and to certain individuals whose positions were secure. Panofsky’s conferring a knighthood on Singer is either a mistake or, as I think, an oblique comment on Friedman’s social pretensions, acting (for that reason) as antidote to any assumption of Singer’s inferiority by reason of Jewish inheritance. This bias is clearly reflected, though probably unconsciously, in d’Imperio’s account of the cryptanalysts’ “plan of Attack” in her Table of Contents, which I’ll treat later. Interestingly, Panofsky does not refer to Dorothea Singer, who was a fine medieval scholar, and who was referenced by Lynn Thorndike in 1921. Charles Singer’s book of 1928, however, makes no mention of Thorndike even though the first and second volumes of Thorndike’s A History of Science and Experimental Magic had been published five years earlier, in 1923. Charles Singer wrote studies in the history of medicine for the first part of his career and then turned to writing history – notably editing the encyclopaedic History of Technology. What Panofsky doesn’t say, and perhaps didn’t know, is that Singer also knew Hebrew, Greek and Latin. He had been born in London. His father Simeon Singer was a rabbi and scholar. Singer was another scholar who had left his home to come with his wife in the 1930s to take up a post in America (UCLA), remaining until 1942. In that year, despite the great risk it entailed, he and his wife re-crossed the Atlantic to return to England. (British naval losses; American naval losses). Singer’s ideas about the Voynich manuscript were apparently developed and communicated only by post and after 1954. What d’Imperio never says is whether such opinions were merely answers given a quiz such as that presented to Panofsky. It is quite likely they were; by 1957 Singer was in England and Friedman shows no interest in reading or learning about medieval art and manuscripts; he likes to have others do that sort of work, and then extract from them answers to set questions of his own devising, in way suited to ‘number-crunching’ and puzzle solving. Friedman relied heavily on feeding quantifiable data-bites into a computer as a means to ‘break the text’. So I think it probable that, rather than buy and read the recommended books, Friedman simply contacted the authors expecting short, easy answers to his own short, ‘baby-steps’ questions. yet he opines to Friedman by letter (responding to a quiz?) that his vague ‘feeling’ is that the Voynich manuscript might be of a Paracelsan and occult-alchemical character, and composed by an ‘author’ living in sixteenth-century Prague. As always, there seems to have been no effort made by the theorist to check whether their ideas were compatible with reality: that is, in this case, to see whether the manuscript’s materials, style of construction or ‘hand’ suited such an idea. (A: they don’t). None of those “feelings” which Singer says more than once are vague impressions finds support from the manuscript itself, but they have found determined support among a group of Voynicheros whose members are quite determined upon. I find Singer’s testimony most interesting as one more of the many instances where a scholar of eminence and wide knowledge of European medieval works can suggest no manuscript at all as close comparison for Beinecke MS 408. This is a point so widely un-noticed, and still less rarely considered for its implications, that it deserves a post of its own. I’ll call it ‘Angels and Fools’. Two volumes of essays, dedicated to Singer, had been published in the year before Friedman was introduced to Panofsky. E. Ashworth Underwood (ed. ), Science, Medicine, and History: Essays on. the Evolution of Scientific Thought and Medical Practice. Written in honour of Charles Singer. Volumes I and Il. (1953). Geoffrey Keynes’ review for the British Medical Journal neatly describes Singer’s character and publications. The British Medical Journal, Vol. 1, No. 4873 (May 29, 1954), p. 1247. Charles Singer, The Evolution of Anatomy: A Short History of Anatomical and Physiological Discovery to Harvey: Being the Substance of the Fitzpatrick Lectures Delivered at The Royal College of Physicians of London in the years 1923 and 1924. Richard Georg [sometimes seen as George] Salomon (1894-1966) – converted to Christianity in 1902; escaped Nazi Germany in 1937. At the University of Berlin, Salomon had studied eastern European history under Theodor Schiemann (1847-1921), Byzantine history under Karl Krumbacher (1856-1909), the history of medieval law under Karl Zeurmer (1849-1914), and Latin paleography under Michael Tangl (1861-1921), under whom he completed his doctoral dissertation in February 1907: Studien zur normannisch-italischen Diplomatik. His name was among the six (with Panofsky’s) listed for expulsion from Hamburg University in 1934. Panofsky’s pointing Friedman in the direction of these men, and texts, was not only wise, but kind. If all Friedman wanted was quiz-answers and easy ‘sound-bites’ the men might provide them; if he he was seriously interested in the manuscript as a late medieval product, studying the texts would begin his education. d’Imperio is dismissive of Charles Singer, though including in her Bibliography five of Singer’s works (p.130) and two articles by Salomon. (p.129). I add a further note on Charles Singer’s theory further below. Q 7: What plain text have you found in the VMS? A: So far as I know, plain language writing is found: first on the pages showing the signs of the zodiac (folio 70 ff.) which seems to be provincial French; second, on folio 66; and third, on the last page, folio 116 verso. The entry on folio 66 reads, as discovered by Professor Salomon of Kenyon College, Gambier, Ohio, “der mus del,” which seems to be ancient German for “der Mussteil,” which is a legal term referring to household implements and stock of victuals which, after the death of a husband, cannot be withheld from his widow. The little figure and receptacles accompanying this entry may or may not refer to this idea. The entry on the last page reads: “So nim geismi[l]ch o.” This is again old German, the first word generally introducing a sentence following a conditional clause; the translation would be: “[If such and such a condition prevails], then take goat’s milk.” The last letter “o” is most probably to be completed into “oder,” which means “or.” The inference is that the sentence is unfinished and that some alternative substance was proposed in case goat’s milk should not be available. I may add that recipes of this kind are quite customary in mediaeval and Renaissance medicine. Granted that Panofsky may, or may not, have agreed with Salomon’s reading of that marginalia – extraneous by definition to provenancing the manuscript’s original content as Panofsky realised (“The little figure …. may or may not refer to this idea”) – there has been a recurring discussion/dispute of Salomon’s reading, with Koen Gheuens’ summary of the ‘pro-‘ position neatly put and illustrated (together with his own thoughts) in his post of July 11th., 2017: Note also that Panofsky is as rigorous as ever in his principles – attributing Salomon’s insights to their author; his very meticulousness in such matters permits us now to credit Panofsky with first attributing to a ‘regional French’ dialect (Occitan?) the inscriptions over the central emblems in the Voynich calendar. Occitan became a topic on the first mailing list during discussion of a book whose narrative attributed this manuscript to the Cathars of Langedoc. The question of Occitan then became one in its own right. 1997 Dennis Stallings published a list of bibliographic and other items relating to Occitan in the first mailing list (10 Feb 1997) including the important note (which was later independently stated by Artur Sixto in a comment to ciphermysteries, (February 17, 2011) that Occitan and Catalan – or Judeo-Catalan – are closely similar. 2004 Shaun Palmer looked at the orthography in detail in 2004. 2009, Pelling credited Stolfi. In other posts, Pelling thought it most like the dialect of Toulouse – though he may have changed his views since then. Pelling first, and others including Don Hoffman later, noted a closely similar orthography on astrolabe inscriptions dating to c.1400. I’ll return to this matter when we come to the astronomical themes. 2015 Commenting at Stephen Bax’s blog (May 18, 2015 – 11:14 pm) ‘Don of Tallahassee’ [Don Hoffman] noted similar forms for month-names used in Picardy, his examples taken from calendars in fifteenth-century Books of Hours. Various others have reached similar opinions, often independently as a result of the ‘Voynich ground-hog day’ phenomenon. Koen Gheuens, ‘Der Musdel: Law in the Margins‘ (blogpost). Q 8: What plants, astronomical, etc, things have been recognised so far? A: To the best of my knowledge, only the sunflower has been identified thus far. To this I should have protested at first – had I been there – that Professor Panofsky must be joking, but then asked more of what he thought that might imply, if he really meant it. Infuriatingly, if this is another reprise of things he had said at the meeting, it is another case of Friedman’s “blind spot” at work. An iconographic analyst of Panofsky’s calibre is (so to speak) the theoretical physicist of the art world; he has to know pretty much everything about everything expressed in visual form through the periods in which he specialises, and that includes the way plants and creatures are depicted in a given place at a given time AND what the depiction indicates about the signfiicance embedded in forms and details: that is, what non-superficial messages the image conveyed for persons of that time and environment. He would have to know the traditions of the bestiaries as well as the place of a creature in the schemes of Christian theology and moralia, as well as classical Greek and Roman lore. And so too for plants: is a rose intended as allusion to the Virgin Mary; to ‘Roman de la Rose’; to the physical rosa mundi; to an intended parallel between the pure soul of Mary as antidote to spiritual ills and the Rose as supposed protection against Plague … and so forth. This issue of intended significance is the one most noticeable by its absence in writings by persons who claim to ‘analyse’ imagery but who know nothing about it. As regards plants, Panofsky’s well-known statement that “the rise of those particular branches of natural science which may be called observational or descriptive—zoology, botany, paleontology, several aspects of physics and, first and foremost, anatomy — was . . . directly predicated upon the rise of the representational techniques.” could not have been enunciated without a prior and thorough grounding in the way those fields of learning were illustrated before and during the period of the Renaissance. Erwin Panofsky, Artist, Scientist, Genius: Notes on the “Renaissance-Dämmerung”, Lecture Given May 10, 1952 at the Fogg Museum Before the New England Conference on Renaissance-Studies. (Metropolitan Museum of Art, 1953). also included in Wallace K. Ferguson (et.al. ), Six Essays on the Renaissance (1962). [pdf] Claudia Swan, ‘Illustrated Natural History’ in Susan Dackerman (ed. ), Prints and the Pursuit of Knowledge , exhibition catalogue, Harvard Art Museums (Cambridge, MA: Harvard University Press, 2011), pp.186-191. Jack Goody, The Culture of Flowers (CUP Archive, 1993). And quite apart from his professional studies, in which he discussed the symbolism intended by depiction of scarlet lilies, iris and honeysuckle, Panofsky’s correspondence shows a keen interest in the very practical aspect of botany: gardening. Did he honestly mean that he could recognise not a single plant in the Vms? Not even in 9v, with its widely-accepted representation of one or more members of the viola-group? Erwin Panofsky, Early Netherlandish Painting: its origins and character (1953) Vol. 1 pp. 333 and note 6 to p.416. ‘Nothing but the sunflower’?? Hmmmm. Q 9: Is it all in the same hand? A: In my opinion the whole manuscript is by the same hand with the possible exception of the last page; but I am by no means sure of that. Q 10: Why was it written’? A: My idea always was that the manuscript was written by a doctor or quack trying to impart what he considered secret knowledge to a son or heir. I have no idea whether Panofsky really believed this. It echoes a view first put forward (whether Panofsky knew it or not) by Georg Baresch who said in his letter to Kircher, “… it is not inconceivable that some good man…”.etc. Panofsky does seem, overall, to have shared the usual assumption of contemporary and later Voynich writers in imagining the work to be all the product of a single ‘author-artist’. The solution to this problem may lie in that as-yet unseen report which Reeds mentioned in the 90s, and described as written by Panofsky to Voynich. Letter of Georgius Barschius to Athanasius Kircher (1639). Transcription, translation and notes by Philip Neal. Q 11: Where & when? A: My guess is that the manuscript was produced in Germany, which is supported by the fact that the goat’s milk sentence is continuous with the text of at least the last page of the manuscript. Q 12: What do you think of the Roger Bacon theory? A: Quatsch. 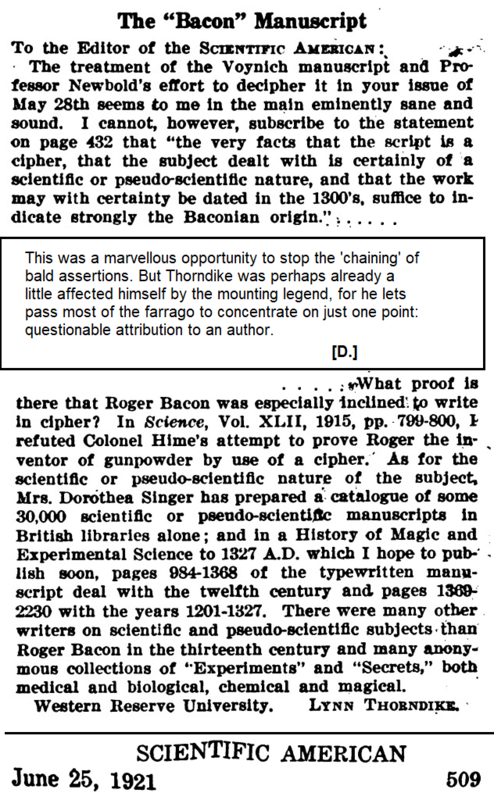 The Roger Bacon theory is in my opinion at variance with all the available facts and has been convincingly disproved by Mr. Manly. Further endorsement of Mr. Manly’s adverse criticism is found in a brief review of his article by the above-mentioned Professor Salomon which appeared in: Bibliothek Warburg, Kulturwissenschaftliche Bibliographie zum Nachleben der Antike, I, Leipzig and Berlin, 1934, page 96, No. 386. Q 13: Full title of the Dictionary of Abbreviations. Title of Hans Titze’s book on forgeries, & of Mibillon’s history of diplomatics. A: The dictionary of abbreviations is by Adriano Cappelli, Dizionario delle Abbreviature Latine ed Italiane; my edition is the second, published 1912, but there may be more recent ones. The book on forgery in art is by Hans Tietze and entitled Genuine and False; Copies, Imitations, Forgeries, New York, 1948. As far as the book by Mabillon is concerned, I am afraid that I did not express myself with sufficient clarity. He did not write a book on “The History of Diplomatics” but his famous De re Diplomatica of 1681 laid the foundations of palaeography starting out with the investigation of documents which were supposed to be genuine and which he proved to be forgeries by studying the development of script. I should like to reiterate my opinion that the Voynich manuscript, whichever its place of origin, date and purpose, is certainly a perfectly authentic document. I do not think anyone could mistake here the asperity with which Panofsky’s answers this question. His “I am afraid that I did not express myself with sufficient clarity’ is a very formal and very cold English- and European form of insult: there is everywhere a point at which extreme politeness becomes an insult. In modern American the equivalent might be: ‘Are you a total fool?’ Panofsky’s then explaining, in words of one syllable, the importance of Mabillon’s book (of which no genuine ‘student’ of medieval manuscripts could have passed three decades in ignorance), tells us yet again that Panofsky has been driven to the point of outrage: this is a venting of professorial wrath. And, need I say, Friedman remained quite unable to weigh the relative merits of amateurs against specialists; Panofsky had said, categorically, that the manuscript was genuine, and yet d’Imperio – who hasn’t any relevant training or experience to judge the matter – decides (as we see later) to keep the option open. The reason has nothing to do with the manuscript itself, but with two fixed yet unproven assertions: that the text is in cipher and that it is entirely the product of Latin (western) Christian culture. Q14: What other scholars are interested in the VMS? A: The only scholar who still takes some interest in the Voynich manuscript is, so far as I know, Professor Salomon, already mentioned twice. “already mentioned twice.” (and doubtless also in the ‘conference’ shortly before). Panofsky has now quite lost patience with Friedman and his ‘quiz’. That Panofsky omits mention of Charles (or of Dorothea) Singer here, again suggests that they had not yet, to his knowledge, been involved with the study. Charles Singer’s opinions, as quoted by d’Imperio, come from letters dating to 1957 or so. Q15: What do you think of the artificial language theory? A: I do not feel qualified to pronounce about the probability of your [sic!] “artificial language” theory. I must confess that, for the time being, I am a little skeptical in view of the fact that, so far as I know, no attempts to construct such an artificial language can be shown to have been made until the beginning of the seventeenth century, whereas cipher scripts were developed and employed at a very much earlier date. As I mentioned in conversation, the Italian humanist, Leone Battista Alberti, welcomed the newly discovered “hieroglyphs” as a kind of writing that was independent of language differences and was therefore understandable to all initiated; but this would seem a rather different proposition because the hieroglyphs were not an artificial language developed, on systematic grounds, by a contemporary author but were reputed to be a sign language actually used by the Egyptians and therefore particularly attractive to the humanists who credited the Egyptians with a wisdom even more profound than that of the Greeks and Romans. Panofsky’s comment about the dates being wrong for a deliberately-constructed artificial language (as such; not including newly-created scripts or alphabets to render a language) is absolutely right, and Friedman’s ignorance of even that – his own field – is once more evident. It is another item in proof that Panofsky was already better acquainted with the history than was Friedman. Panofsky also knows of O’Neill’s paper, published in 1944, though his knowledge of Alberti had long been part of his own scholarly repertoire. As, I expect, was his knowledge of medieval and Renaissance palaeography, essential to provenancing manuscripts and evinced by his familiarity with the books of which Friedman was still ignorant, though already had referred to them during their talk. His allusion to hieroglyphics is most likely to refer to the Hieroglyphica of Horapollo which has made such an impression on Dürer (among others). The edition by Boas includes some of Dürer’s drawings and an essay on the subject. SUMMATION: In my view, the assumptions made by Friedman, and the ‘theory’ on which his mind was already set – combined with his arrogance and ignorance of the basics needed to form a valid preliminary assessment of any medieval manuscript, but especially one whose content was obscure and imagery anomalous, effectively deterred Panofsky from bothering to provide Friedman with any informed comment on the manuscript’s imagery. It also – in my opinion- led him to avoid giving his personal assessment of the manuscript’s cultural origin, script or iconography. I read his responses chiefly as intended to ensure Friedman had no further excuse for contact. Erwin Panofsky, Korrespondenz 1910 bis 1968. Eine kommentierte Auswahl in fünf Bänden, hrsg. von Dieter Wuttke (Wiesbaden: Harrassowitz Verlag): Bd. I,Korrespondenz 1910 bis 1936 (2001); Bd. II,Korrespondenz 1936–1949 (2003). English reviews e.g. International Journal of the Classical Tradition, Vol.11 (2004) Dec (Issue 2), pp. 280-292. Bibliothek Warburg, Kulturwissenschaftliche Bibliographie zum Nachleben der Antike, I, Leipzig and Berlin, 1934, page 96, No. 386. NOTE: This document is reproduced by the present author by permission and should not be taken and re-used without (1) reference to the present author (as ‘finder’); (2) to this blog-post and (3) seeking permission for re-use from Yale University’s Beinecke Rare Books and Manuscripts library. A fee may be required. Next post: Cryptanalysts – Panofsky’s comments on provenance 1931 1932.